. During World War II, Navy Nurses served on several places spread all over the world. For example, nurses were assigned to Naval hospitals and smaller medical units in the South Pacific, the Caribbean, West Indies, the North Atlantic, Africa and Europe. In addition, Navy Nurses worked in air evacuation and abroad hospital ships. However, the big majority of nurses was deployed within the continental limits of the United States. They were serving at 40 Naval Hospitals, 176 dispensaries and 6 hospital corps schools inside the United States. . Here are most overseas deployment stations of Navy Nurses . After the end of war in September 1945, the deployment of Navy Nurses at overseas stations was soon reduced. No more Navy Nurses served in Europe and Africa. The number of stations in the South Pacific area where Navy Nurses were appointed was decreased. Experience of a Lifetime . Off-duty excursion in the Canal Zone ..... Navy Nurses had the chance to see many parts of the world. Traveling was very expensive at that time and usually was reserved for well-off people only. The service in the Navy Nurse Corps offered attractive opportunities to see foreign countries and to become acquainted with other cultures. Especially, some of the South Pacific Islands where the Navy kept advanced bases were well known for their exotic beauty. 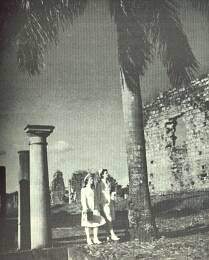 During the off-duty time, nurses had the possibility for sightseeing. Many Nurses made unforgettable experiences. In 1944, some Navy Nurses who served abroad the USS Refuge in the Mediterranean area were invited to an audience with the Pope who was interested in their work and met him personally for an interview. About a hundred Navy Nurses were assigned to the Royal Victoria hospital in Netley , England. This hospital was famous because it boasted a cornerstone laid by Florence Nightingale. Additionally, it was rumored that the hospital housed a heartbroken ghost of a nurse from the Crimean war who had slept while her lover died in one of the wards. The Navy Nurses assigned to this hospital treated almost 8,000 D-Day invasion casualties up to September 1944. 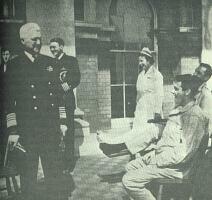 .... Admiral Stark visiting the orthopedic patients in the Navy hospital at Netley on the English coast after the invasion. 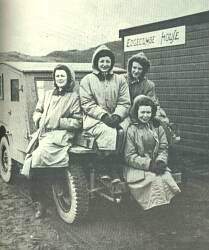 Navy Nurses in Adak (Alaska) presenting Arctic fashions. ... One of the more difficult assignments was duty in Alaska. The weather conditions which the nurses faced were extreme. For example, in Adak the hospital was split up into several buildings scattered over a large area. This measure should avoid that the whole hospital would be destroyed at once. Therefore, the nurses had to walk long ways in cold and stormy weather on muddy streets. Often, they were the only women the soldiers stationed there had seen for a long time and their appearance was most appreciated. 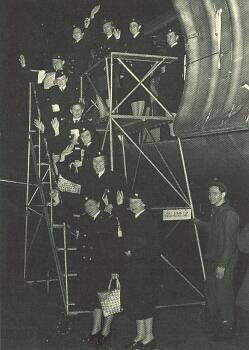 Some nurses had difficulties readjusting to normal life in America after the end of their overseas duty. The nurses sacrificed both youth and beauty to serve in far-off lands where the dangerous conditions and diseases adversely affected their health and caused injuries. Their overseas ordeals had created great hardship that civilian women never faced and could not understand. Furthermore, they had to cope with all the heavy injuries, suffering and dying they might have faced on duty. At least, they knew that they did an important and courageous job. Their work, often not very far away from the front lines, had saved many soldier's lives. . Prisoners of War (POW) . Sixteen Navy Nurses who served in the Pacific were taken prisoners of war during World War II. Fortunately, all of them survived the imprisonment despite the often life-threatening conditions. .
. On 10 December 1941, the first five Navy Nurses were captured on the Island of Guam in the Marianas Islands. In early 1942, they were transported on the Japanese ship Argentina Maru and taken to the Prisoner-of-War-Camp in Zentsuji, Japan. In March 1942, the nurses were transferred to Kobe by ship and interned at an old hotel. There, the conditions were fortunately a little better than endured in the camp. During the time of imprisonment the nurses helped sick and wounded internees whenever they could. Eventually, the 5 Navy Nurses were freed in a diplomatic exchange of prisoners of war. They left Japan in the end of June. One Navy Nurse married a foreign service officer during the return trip and followed him to his new service destination. On 24 August 1942, the other four nurses arrived back in New York. On 1 January of 1942, Manila in the Philippines Islands was conquered by the Japanese. The 11 Navy Nurses stationed there were taken prisoners of war on the next day. On 8 March, they were interned at the Santo Tomas civilian internment camp in Manila together with about 3540 other internees. The nurses worked in the camp hospital and were supported by additional Army Nurses who became interned in July 1942. The life in the camp became more and more strenuous and difficult with more and more prisoners added. The illness and hardship increased. .. This picture of Lt. Margaret Nash taken in the Santa Tomas prison camp was found on a Japanese prisoner during the invasion of Leyte and was the first indication that Miss Nash and the other Navy Nurses might be alive. When a new Internment Camp was set up at Los Banos, all Navy Nurses together with one British nurse and a Filipino nurse volunteered to go there. 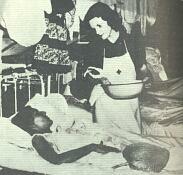 At Los Banos, the nurses improvised a camp hospital that started with practically no equipment and supplies. Some of the prisoners were trained by the nurses to help them. The prisoners had to life in constant fear for their lives. Especially, the starvation became more and more serious during the last months of interment. 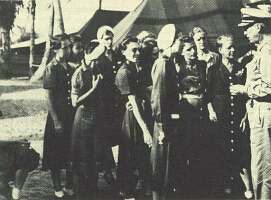 Navy Nurses, POW, just released from Los Banos Prison Camp, Philippine Islands. .. On 23 February 1945, the over 2000 internees at Los Banos were freed in a hazardous mission by ranger forces of the Army. Since the internment camp was some 24 miles behind the enemy lines, the liberation was very risky. However, it was necessary to act as soon as possible because more and more prisoners died due to the lack of food and medicine every day. After 37 months of hunger and fear, all 11 Navy Nurses were saved. On 4 September 1945, these 11 Navy Nurses were awarded with the Bronze Star Medal by the U.S. Army “ for meritorious achievement, while in the hands of the enemy, in caring for the sick and wounded.”. In addition, the Navy awarded them a Gold Star in lieu of a second Bronze Star Medal on the same day. Further rewards were the Army Distinguished Unit Badge for the Unit of Nurses who had served at the Canacao Hospital, the American Defense Service Ribbon with star, the Pacific and Asiatic Service Ribbon with two stars, the Philippine Defense Ribbon with one star and the Philippine Liberation Ribbon with one star. Evans, Helen Gorzelanski, Laura Cobb. ..
One Navy Nurse, Ann Bernatitis, was able to escape Japanese imprisonment in a hazardous escape. At first, she was stationed with 11 Navy Nurses at Canacao, Philippines Islands. All twelve nurses were evacuated to Manila shortly before the enemy invasion in December 1941. While the other nurses stayed in Manila (and were captured by Japanese in January 1942 - as described above), Ann Bernatitis was ordered to a field hospital in Bataan, at the end of 1941. There, she was part of a Navy operating unit with the Army. At the end of March, the Japanese started to attack Bataan. Two days before Bataan fell, the one Navy Nurse and eleven Army Nurses stationed at Bataan were evacuated to Corregidor. At the beginning of May, Corregidor was attacked by Japanese as well. On 3 May 1942, only two days before Corregidor fell to the Japanese, the nurses were rescued in a dangerous night escape from the island by the submarine USS Spearfish. They arrived safe in Fremantle, Australia on the 20th of May. Commander Ann Bernatitis presenting her Legion of Merit Medal .. After Ms. Bernatitis return to America, she went back to nurse duty. Furthermore, she was assigned to additional public relation work to tell her adventurous story of the escape and encourage more nurses to join the Navy Nurse Corps through her courageous example. Ann Bernatitis later was awarded with the Legion of Merit Medal, the first Legion of Merit Medal awarded to anyone.